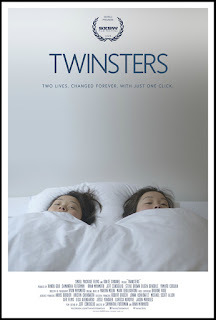 The last time I went to the movies, I saw the poster for Twinsters and immediately recognized these twin sisters from a different documentary by DANakaDAN, who had also been adopted out of Korea as in infant and returned to Seoul in 2013 to meet other adoptees and find his biological family. I'd seen his documentary last year and remembered the twins for being really cute together, and for one of them being French. However, I hadn't known that the twins were also shooting their own documentary at the same time as his! Usually the good indie films don't show anywhere near where I live, but I was in luck this time, and Ma and I went on an evening date to the cinema! After seeing a YouTube video featuring an actress who looks exactly like her, fashion student Anaïs Bordier (raised in France) uses Facebook to get in contact with the actress, who turns out to be Samantha Futerman (raised in California). Now aware of each other's existence and resemblence, the two women search for answers together to ascertain if they're related or not. They discover that they're identical twin sisters who were separated at birth. A miraculous story of twins finding each other after 25 years apart. "Two lives. Changed forever. With just one click." What I really like about this film: I love how the film uses social media (texts, Facebook messages, Skype conversations) as documentary evidence to restructure the progression of their relationship for the audience. Of course it's only fitting, given how they found each other. It's amazing how they take to each other so quickly and form such a fierce bond even before meeting each other, When they finally meet in London, they love on each other as if they're kindred spirits reuniting after a short absence, not two young women from opposite sides of the world meeting each other for the first time. Also I love how French Anaïs is! I mean duh, she is French, raised in Paris and all but─just watch the film and you'll see what I mean. I also appreciate that while the film showcases how similar the two sisters turn out to be─from physical appearance, to likes and dislikes, to that annoyingly cute "pop!" sound they like to make with their mouths─it also recognizes how the girls have experienced adoption differently. Unlike Sam, Anaïs was an only child and had a hard time coming to terms with having been adopted. She often felt like she had been abandoned and was unloved, and as a result she had trouble managing her anger and seeing her adoption as an overwhelmingly good thing. That part of the film is essential in acknowledging that though they're identical twins, they're not the same person, and adoptees don't all deal with being adopted in the same way. Plus it makes the story even more compelling when Anaïs realizes that she had been loved all along, even before she was adopted. What I don't like about this film: Nothing. I've been trying to come up with something to critique in the week since I've seen the film, and I got nothing. At first I complained internally that we see and hear more from Sam than Anaïs. Of course this was just my francophone/francophile bias kicking in, and I realized that since Sam is the filmmaker of the duo and took the initiative on this project (director and writer, this is literally her film), so naturally we would end up getting slightly more perspective from her than her sister. So yeah, basically my point is that I have nothing substantial to complain about. Would I recommend it? : Without a doubt! Absolutely! Go see it with a loved one and have your hearts warmed, shed a tear or two.